Wish you all a happy festive season. The first festival of the year in India is harvest festival. 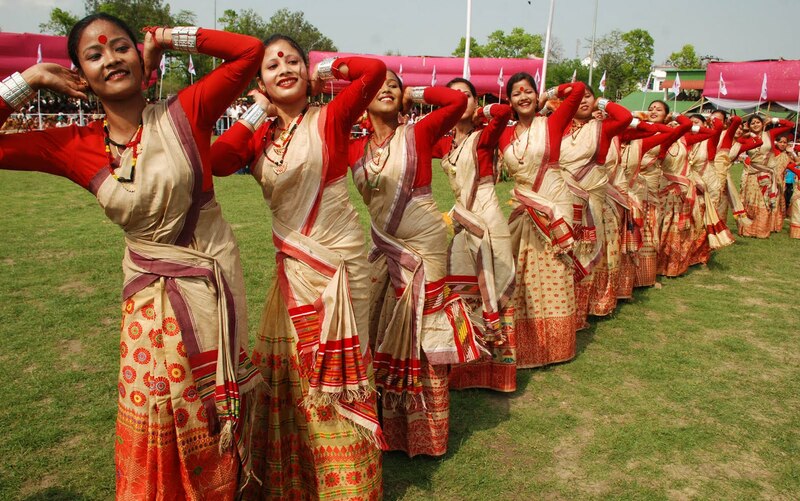 It is celebrated in different states by different names as Makar Sankrant, Ugadi, Lohari, Pongal, Bihu, Bhogi etc. Here are a few glimpses of the lovely festival celebrations. Ok, moving on, today’s alphabet is M and the skin food is Muskmelon. Muskmelon, also known as Cantaloupe, is called Kharbuja in Hindi. Nutritionally, muskmelon is a high fiber fruit, with an abundance of vitamins A and C, and potassium. This makes muskmelon a nutrient-dense food, meaning its nutritional benefits outweigh its calorie content. Beta carotene: Orange coloured fruits and vegetables are rich in beta carotene. Our body converts beta carotene into vitamin A. Muskmelon provides more than 3000 mg of beta carotene per 100 gm. Vitamin A is a powerful anti oxidant.As vitamin A promotes cell turnover in the skin, it prevents cell damage and premature ageing. It is effective in preventing the formation of comedones that cause the most common forms of acne. Vitamin C: The high vitamin C content in muskmelon assists immune system function by stimulating white blood cells to remove bacteria and viruses from your body. Vitamin C also works to regenerate vitamin E rendered inactive by free radicals. Vitamin E is an essential skin nutrient. Vitamin C is a powerful antioxidant which fights free radical damage. It is also very important for collagen formation. Collagen gives our skin its firmness and elasticity. Lack of collagen renders our skin loose and prone to wrinkles. Polyphenols: Polyphenols are recognized for their disease prevention and anti-aging properties. While muskmelons contain significantly lower polyphenol concentration than other fruits like strawberries and grapes, people tend to eat larger serving sizes of cantaloupe. Due to this muskmelons contribute more polyphenols to our diet. Potassium: Potassium is an important mineral that plays a key role in maintaining proper electrolyte balance in your body. This in turn aids in enhancing blood flow in the body. A proper blood flow to all the organs, keep the organs healthy. Skin is our biggest organ and a healthy blood flow keeps it healthy and nourished. So guys, there are so many reasons to eat muskmelon. As for the recipe, I personally like to eat fruits as they are. I don’t like recipes with fruits. But many of you may like to try out different ways of eating your favourite fruits. I came accross this different recipe using muskmelon on late Tarla Dalal’s website. I tried it and it really came out well. So posting it. Blend the muskmelon in a blender to a smooth puree. Transfer the puree into a bowl, add all the remaining ingredients and mix well. 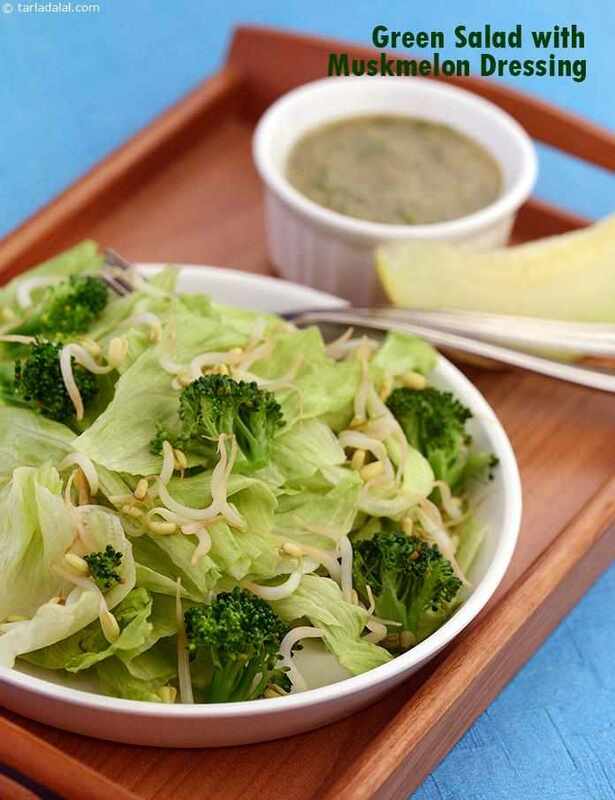 Combine the iceberg lettuce, bean sprouts, broccoli florets and celery in a bowl, toss well and refrigerate. Just before serving, add the muskmelon dressing and toss well. Try this recipe and do let me know. Enjoy! !